Our first art therapy session of the New Year begins with a reading of the book, A Perfectly Messed-Up Story by Patrick McDonnell. This bestselling author and award-winning artist creates a funny, engaging, and almost perfect tale about embracing life’s messes. Little Louie’s story keeps getting messed up, and he’s not happy about it! What’s the point of telling his tale if he can’t tell it perfectly? But when he stops and takes a deep breath, he realizes that everything is actually just fine, and his story is a good one–imperfections and all. An excellent reminder for all of us, (especially during the month of broken resolutions). 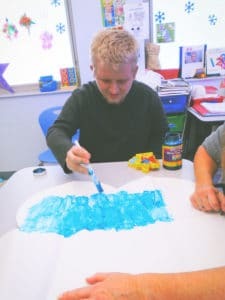 After the story, students are encouraged to create their OWN ‘perfectly messy story’ with glitter finger-paint and large paper cut-outs. Some of us like to get our hands dirty and others not-so-much, so brushes are provided to allow everyone to participate. How messy your artistic story becomes is up to you! Afterwards, we color “2018” printables to remind us that our stories are starting over fresh, and that we have an entire new year ahead of us to enjoy it!